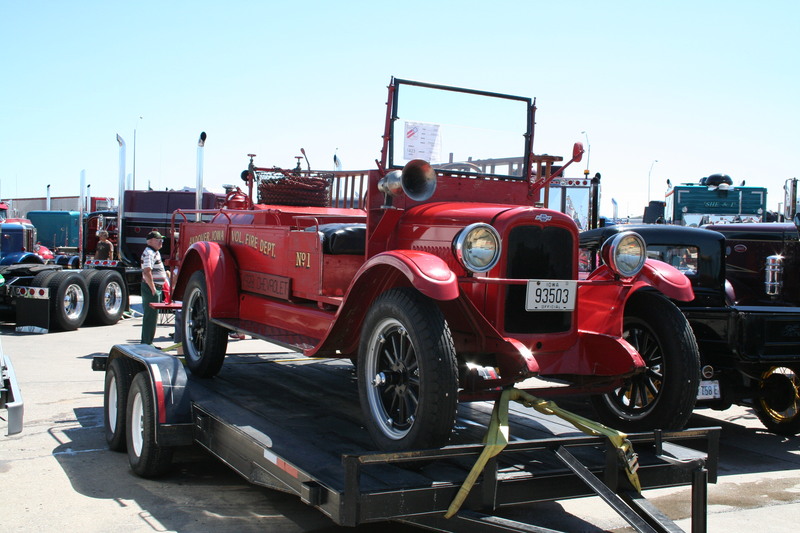 This old 1928 Chevrolet fire truck was at Iowa 80 Truckstop's annual Walcott Truckers Jamboree. Phil Roberts photo. Note: This was written in Las Vegas, Nev., in the early morning hours of Nov. 30, 2010. I’m sitting in a big-city hotel room as I write this, and you’d think the street outside my window is named Siren Boulevard. It’s early morning and police cars, ambulances and fire trucks have been racing by periodically for a couple of hours, sometimes two or three at a time, their sirens wailing. That’s life in the big city, I guess. But I’m OK with that. I look out the window most each time an emergency vehicle passes. In fact, when a fire department pumper went by a few minutes ago with its siren screaming and its many red and blue lights pulsating, I would have given anything to have been able to jump on board and been part of the crew. Fire or EMS, it wouldn’t have mattered. In the old days, you could accurately say firemen were part of a brotherhood. But things change, and women are now a valuable and, in most places, welcome part of the fire service. So the word “firemen” has become “firefighter” and “brotherhood” is now “fraternity,” and I’m just fine with that. I spent 27 years as an active duty Walcott (Iowa) volunteer firefighter, 14 of them as one of the department’s first-ever group of emergency medical technicians. There were only four of us in the beginning (1979) and, until others received the training, we felt obligated to respond to every call for which we were available. Although I’m now on the WFD Auxiliary, helping out mainly with public relations and media relations tasks when asked, I hung up my helmet in 2003. I was burned out from responding to an increasing number of calls for service, and my work schedule at that time prohibited me from attending most of the department business meetings and training sessions. Now, seven years later, I’m no longer burned out, and my schedule has eased since I am semi-retired these days. Some of the more senior current firefighters — friends I served with way back when who are still at it — have told me I should consider returning to active duty. I thought about it but have decided not to re-up. It’s not that I wouldn’t like to help. Like many volunteer units, WFD is short-handed during daytime hours when many of the members are at work in the Quad-Cities. I truly miss the fire department, serving the residents of Walcott and those outsiders who’ve had accidents, car fires or medical problems while passing through. But what I’ve gained in knowledge and experience over the years is now offset by age and a body that, thanks to too many years of the good life, is certainly not as fit as it once was. And firefighting can be quite demanding. In addition, the memory of how much I enjoyed being part of a team that worked well together when there was a job to do and played together when the job was done is offset the memory of missed nights of sleep, interrupted family gatherings and the heartache firefighters often feel when they’ve done all they can to help someone, but it hasn’t been enough. That doesn’t mean, though, that this lifetime member of the firefighting fraternity doesn’t still get excited at sound of a pumper’s approaching siren, the roar of its engine and the rumble of its tires on the pavement, whether it’s home or in the big city. An old firefighter never quite gets over that. Copyright 2010 by Phil Roberts, Creative Enterprises.